Pottery is an amazing artifact. There are many types, all with different designs or no design at all. Designs come from the potter's imagination or his beliefs. All have different tempers, some of grit or small pebbles, some of Spanish Moss that has burned away, leaving only a trace of its existence. Some types are tempered with sand and some with clay; others with what some would call no temper at all, only to discover that there are small, microscopic sponge spicules that hold it together. Think about this. Pottery is a lot like people. Each one was fashioned by the Potter's hand, each uniquely designed from the Potter's heart. Some were designed for daily use while others were designed for special occasions and celebration. All were tempered, but all have a different temperament. How has the Potter designed you and tempered you? What was His special plan and purpose? We are clay in His hands. Many are like much of the pottery we find, broken and discarded by the world, but there is still hope. Like the pot sherds that were broken and cast aside, then recovered and rounded into gaming stones to become the center of joy in an Indian's life, our broken lives can be renewed to become the center of joy in the Potter's heart. 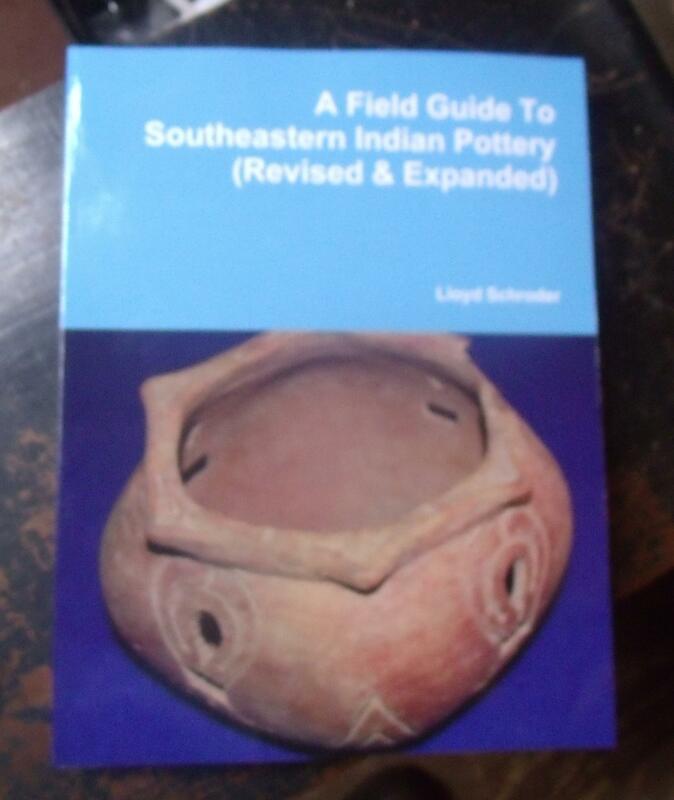 For more detailed information on these and other pottery types within the Southeastern United States, please see our "Publications" page to order Lloyd Schroder's Field Guide to Southeastern Indian Pottery. RESEARCH: This type was named by Steve Wimberly in 1960. It is known only from the Bayou La Batre Shell Midden site in Mobile County, Alabama. TEMPER: Moderate amounts of medium-coarse sand, often with grit or lumps of clay, were used as temper. Sherds that are fired completely through are buff to dull orange in color. Sherds that are not completely fired have a dark gray core. SURFACE DECORATION: The decoration of this type consists of individual, carefully applied, parallel impressions of a cord-wrapped dowel that run vertically, diagonally or horizontally across the entire surface of the vessel. The impressions are spaced from 2mm to 1cm apart and rarely overlap. VESSEL FORMS: Recovered sherds suggest a medium-small to medium deep truncate-conoidal open bowl and a hemispherical bowl. Vessels have ring-shaped or flat circular bases. Later jars had a rounded shoulder and a vertical recurved rim. Some rim stamping may occur. CHRONOLOGY: This type belongs to the Early Woodland period. Its occurrence at the McQuorquodale Mound suggests a time position between Early and Middle Woodland. Associated point types include the Adena point and various spike forms. GEOGRAPHIC DISTRIBUTION: Distribution is expected from the Mobile Bay region and up the Mobile and Tombigbee rivers into Clarke County, Alabama. RESEARCH: Philip Phillips, James Ford, and James Griffin defined this type from their survey of Mississippi in 1951. Their definition of the type was reprinted in the Handbook of Mississippi Pottery Types, SEAC Bulletin No.7 in 1968. TEMPER: The temper for this type was primarily medium to coarse sand with occasional inclusions of very coarse clay particles, gravel, or very small stones. The texture is generally soft and friable due to the good wedging of the clay and the even distribution of temper, although at the Boyd site it was fine and gritty. The surface is usually pink to orange cinnamon with a light to dark gray core. SURFACE DECORATION: Decorations were made with a cord-wrapped paddle. Cord impressions range from 1 to 3mm in diameter and are normally closely spaced, ranging from 2 to 5 impressions per cm. Cord impressions from the rim run in order of frequency from right oblique, normal, parallel, left oblique, and two directions. VESSEL FORM: Known vessel forms include simple, curve-sided bowls, deep bowls or beakers with straight or incurved rims, or jars with globular or sub-globular bodies and recurved rims. Lips are smoothed and rounded with about 20% flattened with cord impressions and with no apparent appendages. Bases were rounded or slightly flattened. CHRONOLOGY: This type belongs to the Tchula and early Baytown periods dating from A.D. 1 to 700. Associated points might include Scallorn and Alba points. GEOGRAPHICAL DISTRIBUTION: Sherds of this type were recovered from the Yazoo and Granada basins in northern Mississippi. TEMPER: This is a coiled pottery tempered primarily with clay, but often with large amounts of sand, giving the sherd a gritty texture with a coarse, lumpy and contorted appearance. Surface colors are usually gray and drab, but pink and buff colors are known (above is pink). High sand content colors are a darker gray or a reddish color with buff colored clay content. SURFACE DECORATION: Decoration was done by impressing individual short lengths of cord into the soft clay and producing simple rectilinear patterns including sets of short vertical or oblique lines (above), chevrons, cross-hatching, and horizontal lines. Decoration is confined to encircling the rim and lip. Occasionally the design patterns are bordered by or used in combination with horizontal rows of small punctations. VESSEL FORM: The most common form for this type is a simple, straight-sided bowl or an out flaring bowl. There is some indication of a jar or bowl form with a recurved rim. Rims are internally or externally thickened with a fold that also serves as a field for decoration. CHRONOLOGY: This type belongs to the Tchula period, dating from A.D. 1 to 500. Associated point types might include Maybon, Edwards and Wilson points. GEOGRAPHIC DISTRIBUTION: This type seems to be more heavily concentrated within the central portion of the survey area done by Phillips, Ford and Griffin, however a scattering of this type is known from other sites within the northwestern Mississippi area. RESEARCH: Hollingsworth discussed this type in his report on the Sheep’s Bluff Shelter site in Franklin County, Alabama in 1991. TEMPER: Limestone was used as temper in this type. SURFACE DECORATION: The entire surface of the vessel is covered with sharp clear cord markings that may be smoothed over in some areas. VESSEL FORMS: Known vessel forms are jars with podal supports and what appears to be folded rims. CHRONOLOGY: This type is a marker for the Middle Woodland period dating between A.D. 150 and 500. Associated point types might include Woodland Triangular points, spike point forms, Baker’s Creek, Camp Creek, Copena, Yadkin, Greenville, and Swan Lake points. GEOGRAPHIC DISTRIBUTION: The distribution for this type is the Middle Tennessee River valley and eastern Alabama. RESEARCH: Jenkins and Krause described this type in 1986. Hollingsworth saw this type in the sites within the upper Tombigbee River Valley and Amanda Regnier encountered the same sand-tempered, simple-rimed pottery at the Davison Creek site in Monroe County, Alabama. TEMPER: This is a coiled pottery type that was malleated with a fabric-wrapped paddle. It was tempered with fine to very fine sand with mica and rarely included clay pellets. The texture is fine and gritty to the touch. The surface may be light gray, tan, light or dark brown, with gray, black, or red-brown cores. The interior surface is smooth and the exterior is covered with cord impressions. SURFACE DECORATION: The interior of the vessel was smoothed. Exterior decoration on this type consists of cord markings that are 1 to 2mm in width (key to identification) and run from the lip in both vertical and angular patterns, and in rare instances run parallel to the lip. Some examples have a plain band extending 1.5cm from the lip, forming a pseudo-rim. The entire surface of the vessel was stamped and no additional decorations accompanied the cord markings. Cord markings are often smoothed over after stamping. Applique strips were added at times to reinforce the rim. These were then stamped with a cord-wrapped dowel. VESSEL FORMS: Vessel forms for this type are deep, conical or semi-conical vessels with simple straight rims or globular vessels with everted or incurving rims. In some cases an appliqué strip had been added to strengthen the rim after stamping. Lips are rounded or slightly flattened. No additional appendages are known. CHRONOLOGY: This type is assigned to the Middle Woodland period, Miller I and II phases dating between A.D. 1 and A.D. 450. Associated points include the Woodland Triangular and spike points. 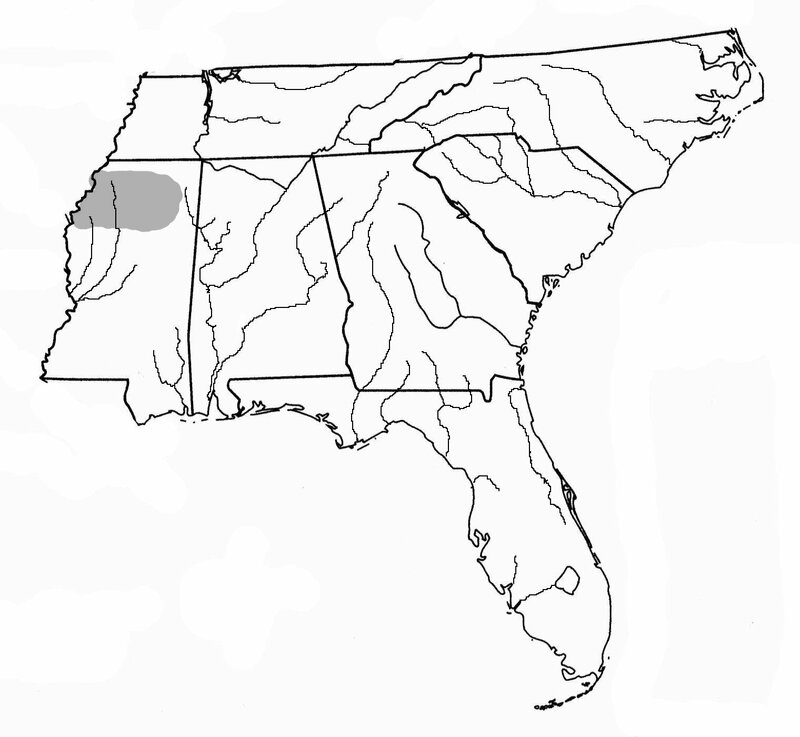 GEOGRAPHIC DISTRIBUTION: Examples of this type have been recovered along the upper Tombigbee River basin in Franklin Co. and east into central Alabama and northwestern Georgia. RESEARCH: This type was first defined by William Haag in 1939. Caryn Hollingsworth reported this type in northwestern Alabama in 1991. Wimberly also encountered examples of this type in Clarke County, Alabama. Hollingsworth recovered 98 sherds of this type at the Sheep’s Bluff Shelter site in Franklin County, Alabama. The type was also recovered from two Redstone Arsenal sites. TEMPER: This is a coiled pottery that is tempered with particles of clay and occasional grit particles. It is thick and coarsely textured. Surfaces are usually gray with a gray to black core indicating that firing was in a reduced atmosphere. Interior surfaces, if not cord marked, were poorly smoothed and lumpy. SURFACE DECORATION: The decoration on this type consists of coarsely textured, clearly marked and tightly twined cord markings that are run vertically, parallel to the lip, or at oblique angles or crisscrossed. On shallow bowls, cord markings were applied to both interior and exterior surfaces. Cord markings are often smoothed over and almost obliterated completely. VESSEL FORMS: Three forms have been identified; (1) Globular or sub-globular jars with rounded shoulders, slightly flared rims and a rounded-flattened base; (2) Deep bowls or beakers that have vertical, slightly incurved sides; and (3) Simple, curve-sided bowls, often with flaring rims. CHRONOLOGY: This pottery belongs to the Late Woodland period in northern Alabama and serves as a marker for the McKelvey II, Miller III, and other Baytown related phases dating between A.D. 80 and 1000. Wimberly suggested that the type may have stretched into the Early Mississippian period. Associated points include both Woodland and Mississippian Triangular points. GEOGRAPHIC DISTRIBUTION: Wimberly stated that this type is found in Louisiana, Mississippi and north-central to northwestern Alabama and Clarke and Mobile counties, Alabama. RESEARCH: John L. Cotter wrote a review of Tishomingo pottery entitled The Miller Types In Review from his research from the Miller site in 1950. His work was published in North Carolina Archaeology (formerly Southern Indian Studies), Research Laboratories of Archaeology and the North Carolina Archaeological Society, Vol.2, No.1. TEMPER: A mixture of clay and grit with occasional fragments of charcoal fossil shell or limestone was used as temper for this type. Clay or grit are the major elements. The paste texture is lumpy, irregular or contorted. Exterior surface colors range from tan, brown, dull red, dark gray to black. Interiors are usually gray or dark brown. SURFACE TREATMENT: The interior was smoothed while the exterior surface, except the base, was stamped with irregularly applied cord marking using a paddle that was wrapped with strings averaging a millimeter or less in diameter that were closely spaced together. No other decorative markings were used. VESSEL FORM: Rims were inverted, straight or slightly everted. Lips were thin and rounded or flattened. Most vessels were deep globular bowls with incurving rims or straight-sided bowls. Bases were thick and rounded or flat. No appendages were used. CHRONOLOGY: This type appears after the Furrs Cord Marked type during the late Middle Woodland (AD 500) and extended into the Middle Mississippian period around AD 1300. Related point types include spike forms, Woodland Triangular, Baker’s Creek, Candy Creek, Copena, Yadkin, Greenville, Catahoula, Homan, Alba, Hays, Scallorn and Swan Lake points. GEOGRAPHIC DISTRIBUTION: Tishomingo pottery has been found throughout the Miller Hopewellian region including northeastern Mississippi, extreme western Alabama and western Tennessee.